This is my first time doing the Currently but I just love reading everyone's so I thought I would give it a try! I spent my summer reading both the Daily 5 and CAFE books, so I am TRYING to implement them in my classroom this year. I am doing OK. I am not really doing all 5 activities and I am still doing some literacy centers. But my kiddos are doing the Read to Self, Read to Someone, and Listen to Reading. I was having trouble figuring out a quick and easy way for them to make their choices. So what I came up with is in the picture below. When my kiddos come in, in the morning they grab their clothespin from the table and put it on the chart by their choice for the day. If they are reading to someone, the person who is clipped on the same number is their partner. My original plan was to have 2 or three of these charts and they would clip for each session that we would do, but are only doing one session so.....I only have one chart. Click on the picture if you would like to download the chart for yourself for free! I would love to hear from you if you download it! Be sure to head over to Farley's blog and catch everyone's December Currently! Visiting from the December currently linky! I just upgraded to a Mac....after a whole YEAR of having a PC that had to be plugged in at all times. (UGH!) I love my new computer and feel spoiled that I can actually carry it around the house with me and not have to find the nearest plug!! 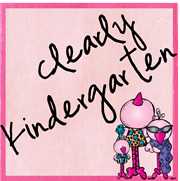 I'm a new follower....always looking for other Kindergarten blogs to follow! OMG! I thought my stinkin' computer was the only one that needed the cord in at all times! I have contemplated throwing it right in the trash can but I quickly talk myself out of that idea. I haven't started Daily 5 yet, we are waiting for Spring but I love your idea... I pinned it so I can come back to it later. Ughh my computer makes me crazy! I am hoping to get get better at the Daily 5 thing! So glad I found you through the December Currently! :) Couldn't resist stopping by when I saw that you were from Wisconsin, my home state. Love your blog and I'm so excited to be your newest follower! Your site is so cute, I just hopped over and followed you! Love to find other Wisconsin bloggers!! Loving Christmas music at the moment too! :) We have a charity radio station in Ireland called Christmas fm that plays nothing but Christmas songs every December. Love it! :) - your newest follower. Thanks for stopping by, I just hopped over and am your newest follower! Congrats on 100 followers!